Dubai, UAE, October 10, 2018: While many of us follow a simple skincare routine that consists of cleansing and moisturising to maintain healthy skin, there are certain skin conditions that require special care such as pigmentation, uneven skin texture, acne scars and early signs of aging and that's where targeted skincare products come in handy. 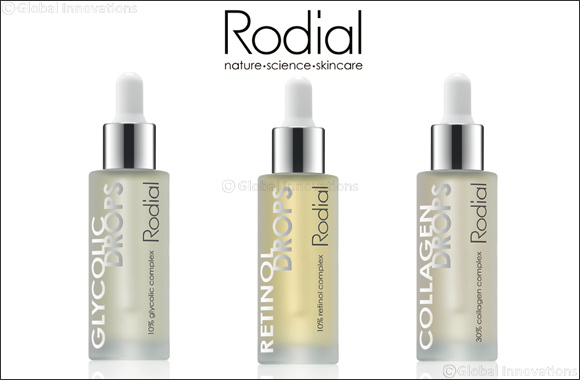 Rodial has recently launched its innovative booster drops, scientifically developed using highly concentrated ingredient and will provide targeted regeneration treatment. Packaged in elegant glass dropper bottles, the booster drops can be mixed with your existing skincare regime for a more targeted effect. The formulas can also be used simultaneously and applied to specific areas of the face for a fully bespoke treatment. The Retinol Complex is a rejuvenating concentrate designed to deliver proven anti-ageing results. This potent, skin revitalising active increases the rate of cell turnover, diminishes the appearance of fine lines and wrinkles for a more youthful looking complexion. It also targets uneven skin tone and pigmentation, while the appearance of pores is visibly reduced for a clearer, brighter, rejuvenated complexion. The Collagen Complex is a replenishing concentrate designed to support skin renewal and target multiple signs of visible ageing. This strong, active protein re-densifies the complexion, aids skin elasticity and prevents the visible formation of wrinkles - revealing visibly hydrated and plump complexion. The Glycolic Complex is a resurfacing concentrate designed to refine the appearance of skin for a smoother, more even complexion. This effective AHA gently exfoliates the surface layer of the skin, encouraging cell turnover and blurring the appearance of wrinkles to reveal a brighter, more radiant complexion. Rodial Booster Drops are available from November at Harvey Nichols and Bloomingdales and online .